It is our sincere pleasure to present to you the Mission Report of the MARS2013 expedition. This (general) report is a non-scientific overview on what happened during the Mars analog mission. The scientific papers are in preparation, conference presentations are already arranged globally and the first pilot data will be presented during the upcoming MARS2013 Science Workshop in Vienna in May. 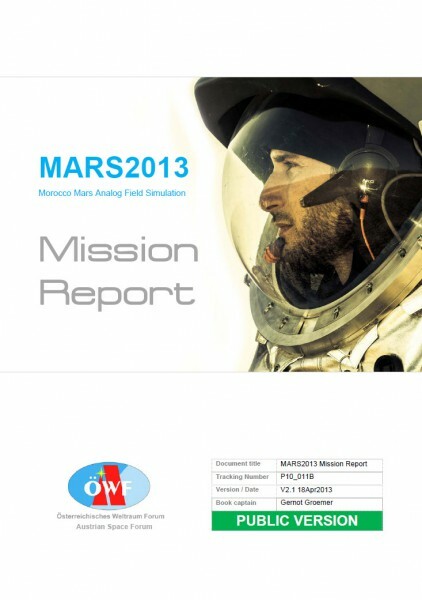 At the same time, the Austrian Space Forum are about to launch the OeWF Multi-Mission Data Archive in the next weeks, the mission book for the general public is about to be printed and the third and final 1hr documentary is in the post-production. For all non-scientific activities, this marks the final milestone of this extraordinary project. There are so many thanks to be said: Ranging from the support of the Austrian Red Cross for the MSC infrastructure, the generous support of the Moroccan government (facilitated through our Austrian Ambassador, Wolfgang Angerholzer), our industrial sponsors and partners, the team of the Ibn Battuta Center and so many many more. 100+ people participating, 23 nations involved, 17 experiments and a tremendous media echo tell the story of a truly international, interdisciplinary and intercultural endeavour. At the Austrian Space Forum, we believe that with MARS2013 we have stated that Mars analog research has matured as a field to a point where agencies can and should pick up, where there is a substratum of a yet young but vibrant scientific community.